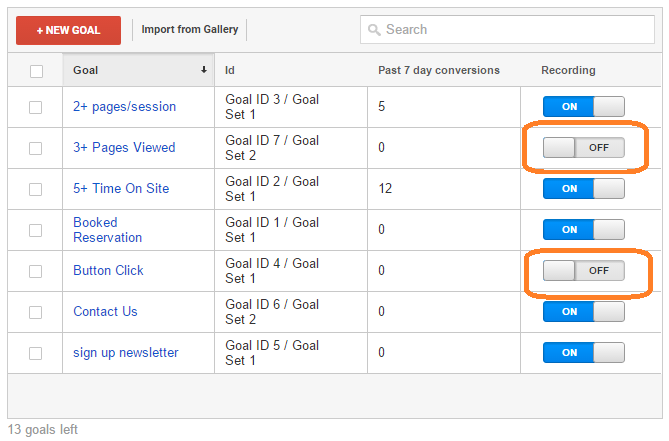 Have you ever set up a goal in Google Analytics, and later wanted to delete the goal from your view? You go into the Admin section, click into the Goals tab for the view, and search for the “delete” button. But you don’t find it. That’s because it doesn’t exist. This is a common question that’s been asked before, and it recently came up at our Google Analytics training last week. 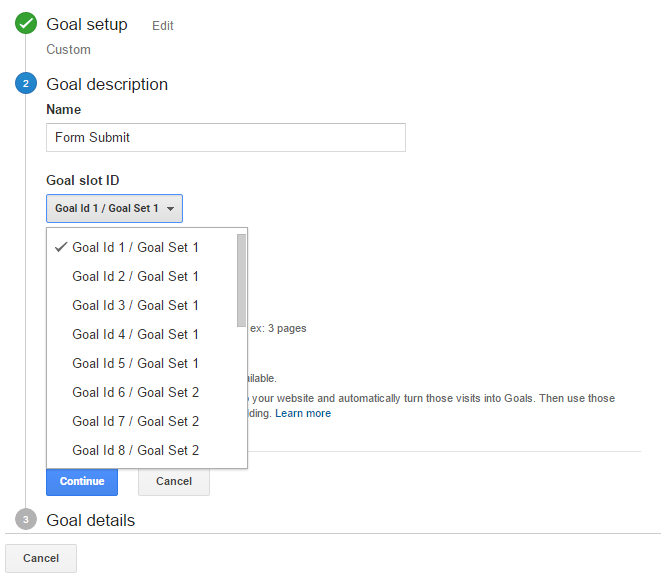 In Google Analytics, you have four sets of goals, each with five goal slots available. Hence, you can create a total of 20 goals per view. Goals let you define success for your website. You tell Google Analytics what you want people to do on your site, and when they do it, it counts as a goal. You can even tell Google Analytics how valuable the goal is to you. By setting up these goals and goal values, you can really start to see what’s working and what isn’t – on your site, with your marketing, you name it. For example, if you have goals set up you may see that organic search drives more traffic, but paid search drives more sales. Or vice versa. Without goals (or ecommerce tracking) you have very little information about what source of traffic is the most valuable, or what content on your site helps lead people to convert. Why can’t I delete my goals? 1. Someone visits your site and views at least one page (maybe more). 2. Raw hits are sent to the Google Analytics servers, providing information about the visitor, the visit and the pages viewed. 3. GA processes the hits. That processing includes view settings, filters and goals. Once the processing is done, the data is sent to the reports. That processing only happens once. So when you set up a goal, once the data for that goal is in your reports, it’s there forever. You can’t go back and change the goal, and expect the data in the reports to be updated. Now your numbers don’t add up, and you’re left wondering why Google Analytics can’t do simple arithmetic (of course, you know why, but does everyone else with access to your analytics understand?). By having the option to set the goals as Inactive, you can still see in the reports that those goals used to exist, and how many completions occurred for them. First of all, you should have a strategy about what you want to track as a goal. There should be a handful of very important things that you want to count (macro conversions) as well as any number of softer successes (micro conversions). Organize your macro goals into one (or more) goal sets and keep your micro goals together in their own goal sets. Of course, there will always be something new that comes along that you’ll want to track as a goal. It’s always tempting to just keep stuffing goals in a view until you run out of room. But that leads to poor organization. Ask yourself if the goal will be around for a long time, or if it’s likely to go away sometime soon. If it’s a temporary goal, consider creating a separate view to keep track of it (and any other short-term goals). If you find that the limit of 20 goals is too constrictive, consider creating views with similar goals grouped together by view. For example, you may have a view with goals geared to your sales division, and another view with goals geared to your customer service division. You can edit the goal, mark it as inactive and delete all other information from the goal, and name it “-“. You can’t leave the goal name or goal URL blank (it will give you an error if you try) but by naming those fields with just a dash, you’ll see that it’s a blank goal that you can reuse. Because you can edit goals, you can always reuse the slots being occupied by inactive goals. If you do this, remember that the previous goal data for the inactive goal will still be in your reports. This can be confusing and misleading, as you may see goal completions for your new goal that were really goal completions for the old goal. 1. Don’t re-purpose goal slots. Just mark them as inactive. 2. If you must re-purpose goal slots, try to keep the new goals as similar to the old goals as possible. 3. Use the annotations feature in your reports to keep track of any changes you’ve made to your goals. It would also be thoughtful of you to email anyone who uses the reports to notify them of the change.